"Ultron created me to be perfect. He thought that meant less human. I do wish to be perfect, but I believe that is to be more human"
bit of an early warning here. I am about to write a post about one of my most favorite of favorites of Marvel characters. 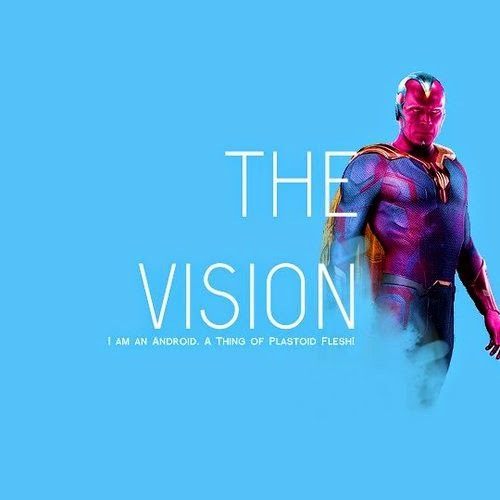 You are forewarned of much fangirling, occasional spazz attacks, and sentences that serve no purpose but to discuss how perfect I think Vision is. You are warned and...I apologize. So, Who IS this 'The Vision'? Vision is an android. But to explain further, I will need to go into the depths of the Marvel Comic History to explain. 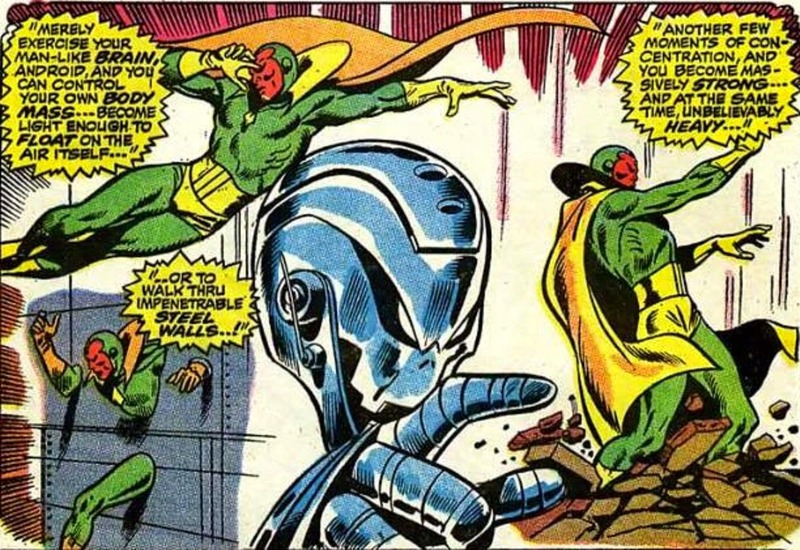 The Vision is a sentient robotic life form created by, originally, Ultron. His purpose was to use as a weapon against The Avengers, and most importantly, Hank Pym (Ant Man and a lot of other names) and his wife, Janet van Dyne (The Wasp). in the comics, it is actually Janet who gives Vision his name, as she is the first to see him and describes him as 'a vision'. And I guess, everyone likes to have a name, so Vision stuck with it. cute. Vision was created using the brain patterns of the deceased Wonder Man (Simon Williams) and after learning how he was brought about, he switches sides and joins the Avengers in the fight against Ultron. Vision goes on to become a full fledged Avengers member (he is again controlled by Ultron again at one point in order to rebuild the maniac. but he over comes that. so mere trifles), and, the best part? Vision and Wanda Maximoff become a real deal. and in case that name doesn't ring a bell, Wanda is, The Scarlet Witch. I know! I'm super excited too, and have made it aware to many people (aka: my family who are probably sick and tired of hearing about me talk about Vision and Wanda nonstop...) that I will be exceedingly happy if there are ship scenes in Age of Ultron. and exceedingly disappointed if there are not. Wanda and Vision ultimately end up having two boys (Wanda creates them using her hex powers) and I can only imagine how happy that makes our android who considers humans to be perfection. being a father is a huge step closer to being a human. Unlike many of marvel characters, whose relationships can bunny trail in so many different directions depending on the writer (I'm looking at you, Natasha), Wanda is the only person paired up with Vision that I know of. I find that remarkably endearing. they were so perfect, why change it up at all? Vision has a solar gem on his forehead that absorbs solar energy that he uses as his power to function. He can dispel radiation as beams for when he is fighting, and the gem can also be used to dispel even an even greater beam with a greater destructive power. but it naturally drains more energy that way, and therefore depletes him quicker. He can control his own density (which I find to be the most fascinating skill he possesses). He can use it to fly, as a phasing ability that means he can walk through solid matter, as well as make it difficult to injure him. How are you suppose to attack a thing with little mass? But by also using his ability to change density, a fairly signature move is his ability to half re materialize, or as wikipedia puts it, he can cause a "physical disruption" to his enemies. It causes great pain and, eventually death, as he can use it to stick his light density (ghostly form) through an enemy, and rematerialize through them. Besides those, Vision is given the normal super human abilities such as heighten senses, strength and speed even at low density. Being an android, his ability to process information is heightened, but that is to be expected. and, he is well versed in his own repairs. I mean, you kinda have to be, when your creator is dead. Its not like he can walk into a mechanic shop with a broken arm and say, "fix this". 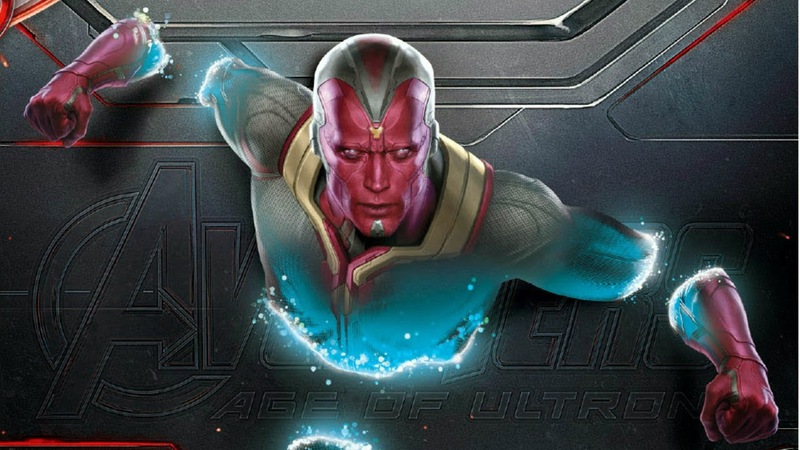 What can we expect for Vision in Age of Ultron? It is too early to pinpoint all the differences, but there are a few things we can definitely expect to see. Paul Bettany, previously the voice of the much beloved Jarvis, was given the role. I find this hugely satisfying. and think his voice and skill will do the role much much justice! 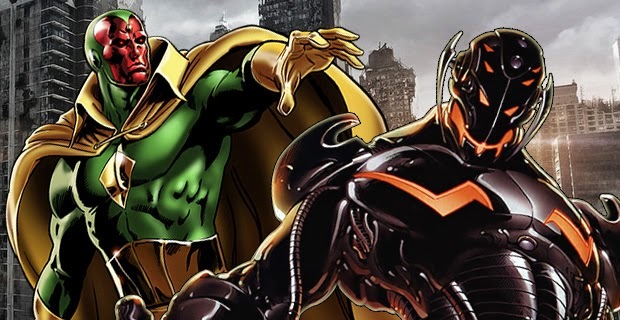 I've heard it rumored around, and it seems very notable considering we haven't yet met Janet or Hank Pym, that Vision is not Ultron's creation in this go around. I actually was kinda looking forward to seeing Vision as a baddie for a brief while, but I'm also interested in seeing how his fresh story pans out. Starting Vision out as a good guy seems very tasteful, and adventurous, and the story can go in so many different ways (just as long as it always leads back to Wanda, I will be happy). His relationship with Wanda. actually...I don't know that. But a fan girl can dream, right? To sum up, when Age of Ultron started getting production work, I was excited. Who wasn't? I followed up with the news, had the opening night penned on my calender, all the works. and then. That two second preview at the end of the trailer. It was so short. but those few quick seconds were all I need to launch me from the 'yay age of ultron so excited' group into the 'SJKFSDAKGHKGAHKFDGA AGE OF ULTRON' group. and so, yes. my excitement level went from 100% to 3000% within two seconds, and if thats not a roller coaster ride of emotions, I don't know what is. Also Vision has beautiful eyes. What girl couldn't fall for an adorable (but very very powerful) android with blue gear eyes? Who are you most looking forward to seeing in Age of Ultron? First off: I appreciate this Vision appreciation post. He deserves it. Also, your gifs basically describe me when I learned Quicksilver was going to be in this one, so I can definitely relate. Hopefully in future films we'll be able to see the Vision use some of these powers, because they'd look amazing on the big screen.